The beauty of Turkish cooking is its amazing clean tastes along with affordability. Fresh ingredients are ever present and abundantly used. There is a fairly routine method for cooking most main dishes. This is highly tasty and effective are served simply and rarely hidden under sauces. Using stunningly tasty, fresh, seasonal ingredients makes for a wonderful cuisine. It's delicious flavours are hard to beat and harder to forget. Chicken, Beef, Lamb and Goat are the meats available in local butchers in Turkey and below we have separate recipe lists for the categories. Chicken is the most bought meat product due to its low price. Turks are good at whipping up some very nice marinades which they do and then grill the chicken pieces slowly on the barbecue. The trick to this is to get a good fire going then let the wood burn down until you just have some glowing embers. The meat is then put on the grill and cooks slowly. This ensures the meat does not go tough, is nicely cooked through and not burnt on the outside. 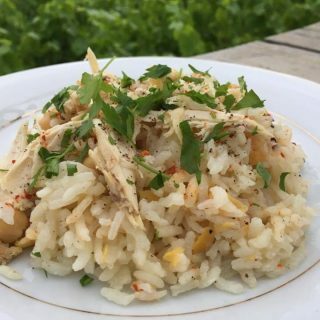 Chicken is replacing red meat in some meat dishes, but unlike Westerners, the Turks favour the fattier pieces as they believe chicken breast is drier once it is cooked. I certainly agree with this. 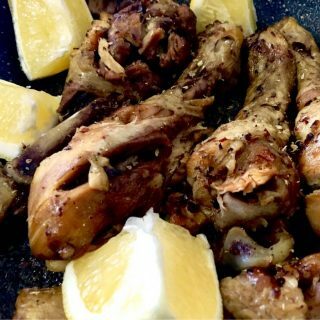 Chicken thighs, boned or otherwise are the costliest cuts of meat but the tastiest in many peoples' minds. Turks have a very delicious cut which they call Chicken Cutlets. These are the drumsticks which they sell already prepared. They scrape the leg meat up the bone to the thick end and it rather resembles a cutlet by the end of it. They have these ready-marinated in many butcher shops and are quite delicious and I've never come across one I didn't like. 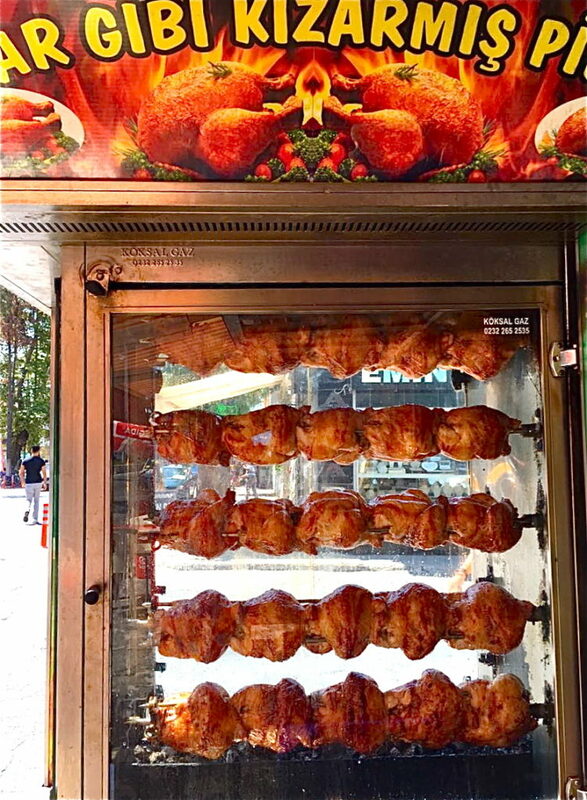 Chicken has also become very popular these days as an alternative to lamb döner or beef döner kebaps in eateries, but I do feel the flavour doesn't quite match the classic alternative. Beef is quite expensive but very popular. It tends to be bought in small quantities and used in many dishes to add flavour rather than be a main ingredient. One of the most famous meals in Turkey would have to be the very simple dish called etli kuru fasulye /beans with rice. Dried cannelloni beans are soaked overnight and then cooked slowly in a tomato sauce with cubes of beef and slices of onion. Of course, added to this are the wonderful Turkish herbs and spices. Although not much meat at all is used in this recipe, the beef flavour pulls everything to the fore and it becomes a very tasty dish. 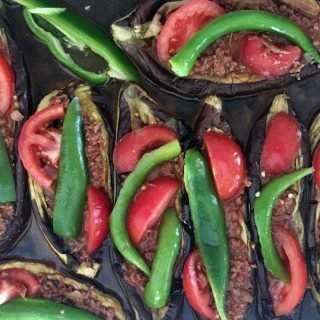 Generally speaking, minced or ground meat is used a lot in the Turkish kitchen, not only in vegetable dishes but also for stuffing and rolling an assortment of vegetables or leaves. 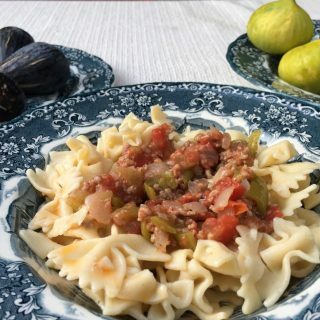 Another very common type of Turkish dish uses ground meat/ kıyma, either lamb or beef, with whatever vegetable happens to be in season eg spinach, green beans, leeks. These dishes are called kıymalı yemek (meat dishes). If you are out and about, you will see that little traditional restaurants will display them in large tepsi/ trays in their windows. These dishes are easy to make, very economical and family-friendly, and also extremely tasty! The most popular meat of all in the Turkish cuisine would certainly once have been milk fed lamb. Sadly due to the large price increase in lamb, it is not bought nearly as much by village housewives these days unless it's a very special occasion. It is seen more often in restaurant dishes where one goes out to dinner with the idea of 'splashing out'. Lamb lends its flavour so beautifully to Turkish cooking but many people brought up in countries where lamb meat is not commonly served are not so fond of the strong flavour. English, Aussies and Kiwis tend to really appreciate the wide use of lamb in the kitchen but for those from some countries such as Italy, where it is rarely reared, they find it hard to eat much of this meat at all. The most common complaint I have heard is due to the strong smell of the meat cooking, one which I personally love. Some of the most famous meat dishes in Turkey are specifically meant for lamb meat and one such dish that comes to mind is called Tandır Kuzu. Large lumps of meat are placed in a woodfired oven to cook extremely slowly. It takes 8 hours or more before it is considered ready to serve. It will then arrive on a platter along with charred green and red peppers, tomatoes and possibly some roasted potatoes which also have been in the oven (but not as long as the meat. It is indescribably delicious and falls off the bone. It is so tender it melts in your mouth). In a butcher shop, if you wish to buy minced lamb meat you need to be specific as often they will have an already mixed mound of ground meat, being beef and lamb which is very popular in Turkish cooking. Goat is also popular but it is a very fatty meat and doesn't have as much flavour as lamb. Goats have very large bones meaning that per kilo in price, you actually get a lot of bone for your buck and many think it is not worth it. It also does not have a truly distinct flavour and is quite chewy. Similar to lamb, this meat is used more often for special occasions where a family might buy a whole goat to serve at a wedding or special function or festival. They will employ the local butcher to come to their house and slaughter it in an 'Halal' manner in their garden area or on the street outside their house. It is important under Islamic Law that the knife be very sharp and kill the beast with one quick cut in a kindly manner. The goat will be in the pot cooking or on the grill well within the hour of its last breath. Pork is 'haram' – specifically forbidden under Islamic Law and will not be seen for sale in any normal Turkish butcher shop. As for the most popular forms of cooking meats, here is a brief description of the various dishes. A kebab is a general term for small chunks of meat (most commonly lamb and beef ) cooked with or without other ingredients. Kebap dishes can be barbecued, roasted, cooked on vertical or horizontal grills, cooked on skewers, cooked in clay pots,stewed with many or few other vegetables. The possibilities are quite endless. The most famous kebaps would be Döner Kebaps, similar to Gyros in Greece or Shawarma in Arabic speaking countries. Döner comes from the word dönmek – to turn. The meat is placed on a vertical grill and cooked slowly as it rotates. These days predominantly chicken is used but still a mixture of beef and lamb can be found. These are more traditional and tastier in my opinion but a bit more expensive. 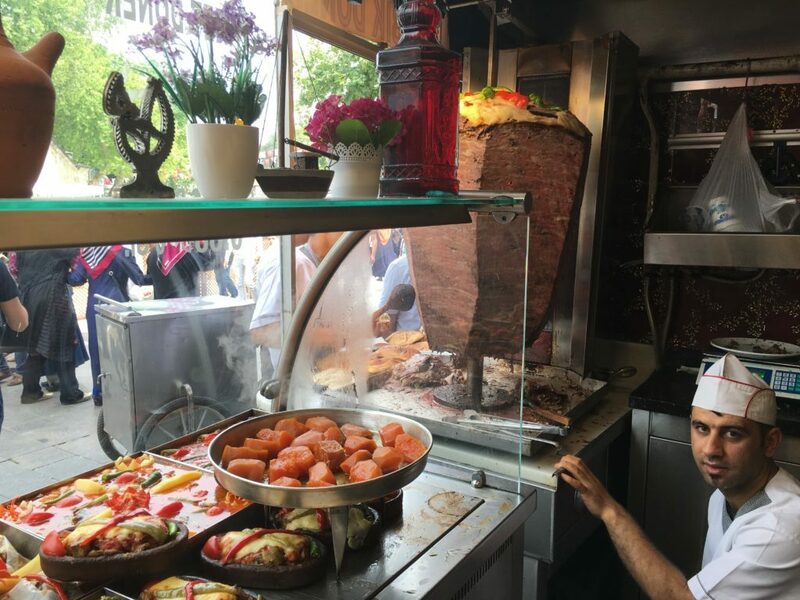 Shavings are sliced off by the kebapci (kebap seller) using a huge knife that slightly resembles a machete from the enormous cylindrical slab of meat that is skewered onto the upright rotating spit. The meat for a döner dish can be served two ways. Either on a plate with accompanying sliced tomato, onion, parsley and some pickled gherkins and small chilli peppers along with a serving of rice or chips or otherwise it will be rolled up with the salad ingredients and chips into a flat bread called Lavaş (lavash). It will then be called a 'Dürüm'. Adana Kebap – This hails from Adana, closer to the Eastern border where the food gets spicier the closer it gets to Syria. 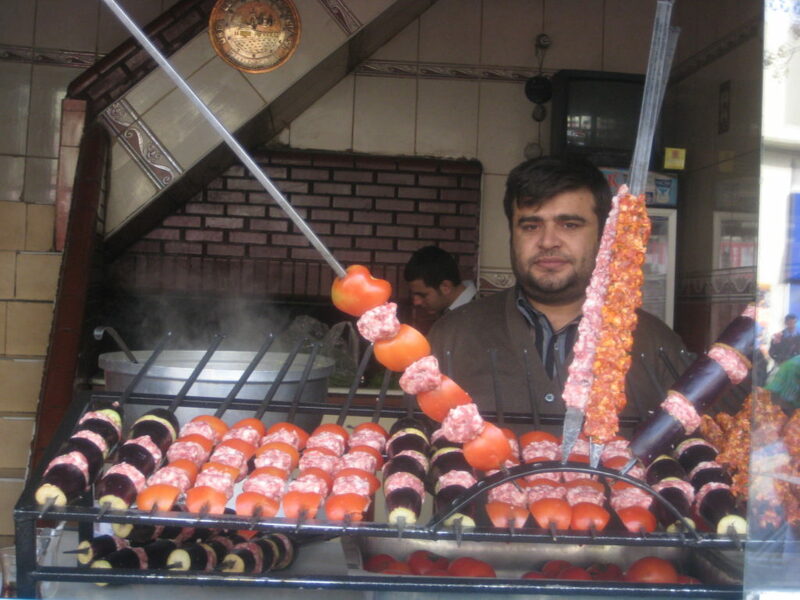 This is a deliciously spicy skewered kebap made from minced meat and various spices, squeezed onto/ around the skewer and grilled over coals. It's non spicy sister dish to this would be the Urfa Kebap which is a thicker meat skewer with no hot spices added to the other flavours. Also delicious. İskender Kebap – named after a famous chef İskender Efendi. This kebap uses the döner meat sliced off the vertical grill. This is served on a plate of chopped up flat bread, topped with a whipped yoghourt sauce, the meat sitting on the yoghourt. Then a tomato type sauce is poured on top of the meat and some hot butter. It is truly recommended to try this marvellous dish if you have the chance. 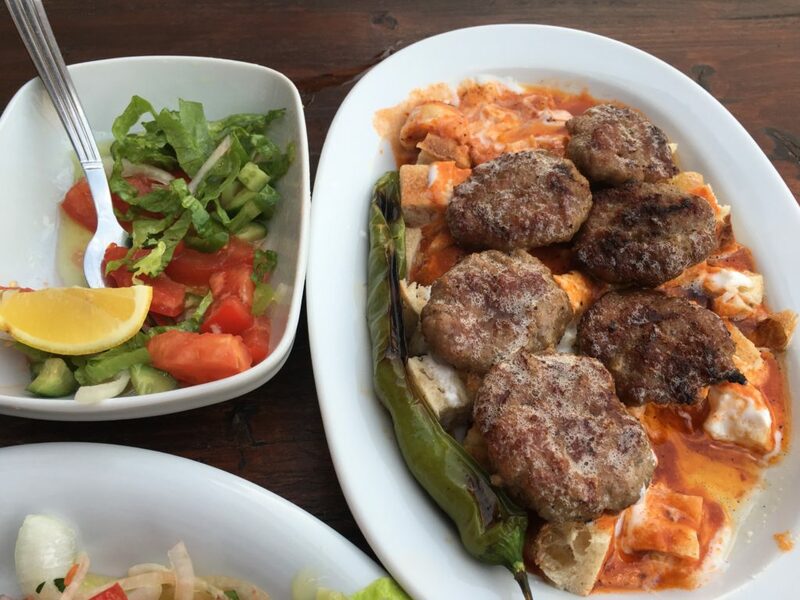 KÖFTE is the Turkish word for meatball and the Turks know how to make these truly deliciously. They are generally made with a mixture of beef and lamb, cumin, parsley, onion and other spices. They are traditionally worked hard in the hands to mix the spices in well and then rolled into a small oval flat shape. Köfte are most often grilled or barbecued but there are also many fabulously tasty recipes where they are dealt with in different manners. 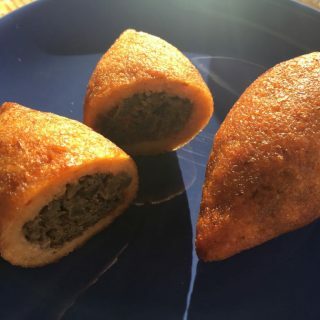 One of my all time favourite recipes would be Izmir Köfte. These are placed in a 'tepsi' round low sided baking tray where they sit in a tomato juice alongside large slices of tomatoes, green peppers and other vegetables, including wedges of potatoes and are slowly baked in their meaty. tomato sauce. Once done, the meatballs and vegetables will be served on the plate alongside some tasty Turkish rice and the juices will then be poured over the meat and rice and dipped up using slices of fresh bread.